This document is being continually updated with the most recent update being October 11, 2016. We appreciate any feedback and comments to help us to improve it. Happy 49erFX sailing! Special thanks to Mackay Boats for writing this manual. The 49erFX is made up from 49er parts and FX parts. Added to the 49er platform is a modern purpose designed FX mast and sails to suit crews between 120kg and 140 kg. The ideal weight for the FX will be around 130kg, – but it won’t matter if you are 120kg or 140kg, – if you have the best boathandling and best rig set up you will win races. This is skiff sailing! We expect to see light crews winning regattas and heavier crews winning regattas. Heavier crews will naturally have a small advantage upwind in heavier airs, but in skiff sailing the lighter crews will still win with better boathanding- and of course they are faster downwind in most conditions! Testing has shown only very small speed differences when 2-boat testing. In the first part of this Guide we have covered the basics on how to set up the FX to make it easy to sail. Later in the Guide we have included a list of extra details you can work on to ‘trick’ your boat out to optimise every system. In all cases we have used the best ideas we have seen in the 49er boat park. 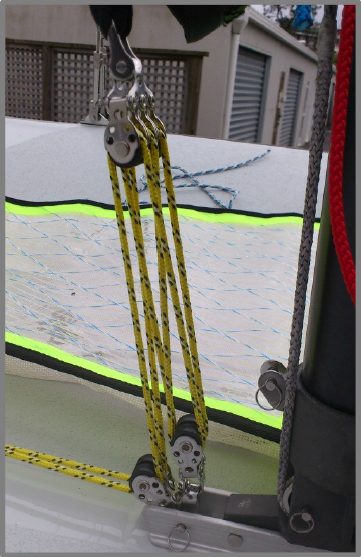 Basic Set-Up: The class rules allow an extra purchase in the jib sheet and an extra turning block in the gennaker. Jib Sheet: We recommend all crews use the extra purchase in the jib. 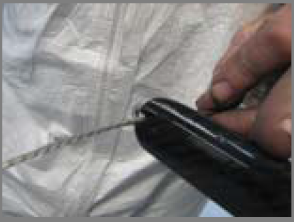 As you get better this will allow you to make small trim adjustments quickly and smoothly- plus it allows you to pull the sheet in quickly to the correct setting. Sail Controls: To be fast in all conditions you will need to be able to adjust the Vang and Cunningham easily. 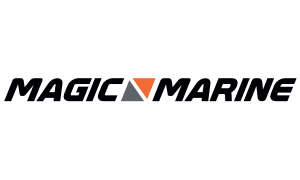 This requires low friction systems with maximum purchase. The 49erFX will be supplied with an extra purchase in the Cunningham system as shown below. 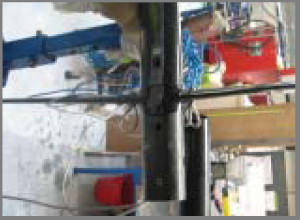 Picture on the right shows the vang double block attaching to the sheave pin in the mast base using a loop. Check that the blocks on the mast step channel are able to lie down so they don’t get in the way when you are stepping the mast. A simple attachment system that achieves this is shown here. The triple block is attached to both tack webbings using a single shackle. There are many ways to attach the blocks but the important thing is to have low friction systems using the best quality blocks and correct size ropes. Check to make sure the ropes are not crossed up and rubbing on each other. Trapeze Lines: Trapeze lines should be spliced with a sliding tail to allow you to adjust the height for different conditions. With the trapeze lines as short as possible and with the splice pulled tight, they should be somewhere between the top of the boom and 100mm above the boom. (this will depend on crew heights and personal preference.) This will allow you to get high enough in light airs. In heavy airs you will slide the splice to lengthen the trapeze lines. You can adjust this easily between races. 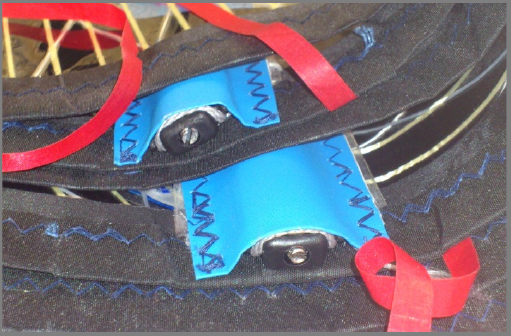 The usual cleat and block adjustment system will then give you the travel needed during racing. Foot Straps: Foot straps are essential. They also need to be customized for each crew. You can buy ready made straps or get some made. It is important that they are stiff enough so they are easy to get your feet into. Make sure you don’t squash them when you put your cover on. The best option is to make up some foam blocks to go under the straps for when the cover is on. 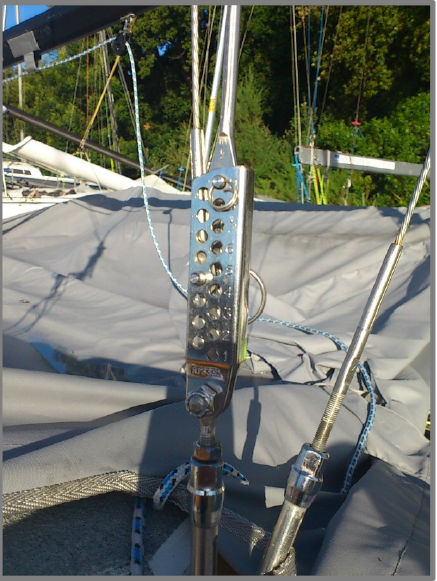 You will need to use most of the travel on the sidestay turnbuckles and the adjuster to achieve the optimum rig settings through the wind range. 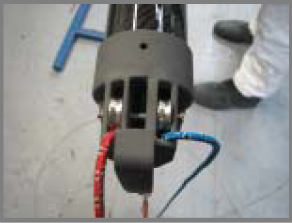 To achieve this, the wire lengths are critical. Start with the primary shrouds in the front top or 2nd hole down from the top on the stay adjuster. In lighter airs the upper stays will be in the lower holes on the adjuster. As the wind increases the uppers will be eased off and will need to be a maximum of 2 full holes, more typically 3 half holes). The lowers will also be eased as the wind increases. When the lowers and uppers are eased, the forestay tension will reduce a lot. 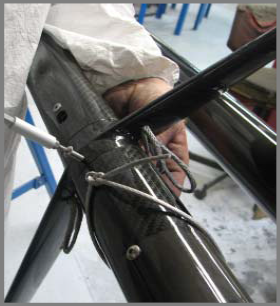 Therefore the shrouds will need to be tightened using the turnbuckles to increase rig tension and reduce forestay for the heavier winds. In the picture you can see that the top of the adjuster has been cut off. This helps the 2 wires to sit comfortable beside each other. 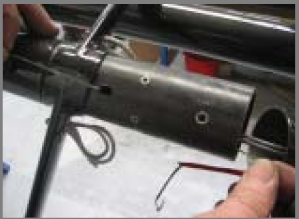 Also note that the adjuster and turnbuckle have been bolted together using a bolt with only a short thread on the end. This is neater and safer than using a clevis pin. Below are our current recommended settings. These will be updated over the next year as we get more feedback. The settings are taken using a Model PT-1 Gauge from Loos & Co. Be aware that these gauges wear over time and vary a little also. It is good to check the calibration of your gauge from time to time against a new gauge. Pre-bend is measured using the jib halyard. Pulled tight, just touching the mast at the Southern Spars logo- measure the distance away from the mast at the gooseneck. The D1 tension may need to change a little to achieve the correct pre-bend. The FX rig can carry more rig tension than the 49er, so over time we expect to see the tensions increase a little, especially in medium and heavy winds. The Shroud (D2) tensions are for reference only. 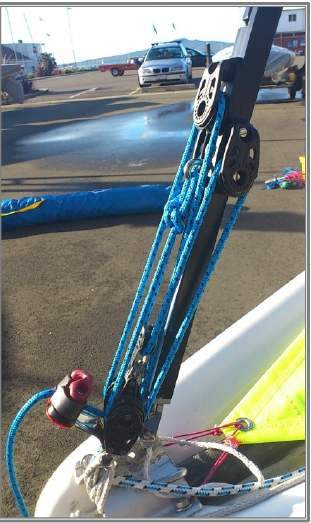 Use the Forestay, Lowers and Upperstensions when setting up your rig. Jib set up: As the wind increases the jib car will need to move outboard. The jib sheeting is changed by lowering the jib tack as the wind increases and moving the jib sheet lower on the clewboard. 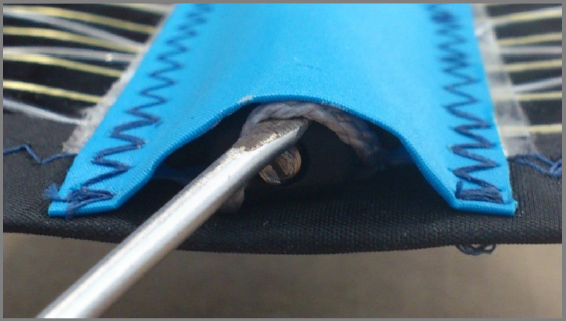 It is a lot easier to move the tack once on the water, but an easy change clew attachment is good to have when you are caught out by big changes in conditions. This is best done using a small Wichard snap shackle. Below are some general comments to help understand how the rig set-up changes through the wind range. The rig is depowered by loosening the Upper stays as the wind increases and using more and more downhaul. A lot of vang is used in the medium conditions and then vang tension may eventually reduce a little as the wind increases and downhaul is at maximum. 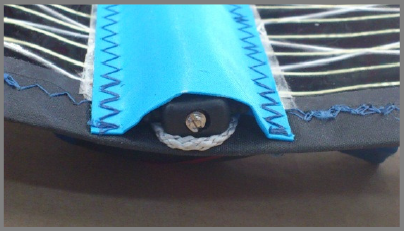 Upper stay tension is increased a little in light conditions before full wiring to ensure the top of the sail opens. This can be eased off as soon as both sailors are wiring. Remember, you get more power from leech tension than extra sail depth in the head. Don’t be fooled into making the top too full in the light only to then have to ease the sheet to keep it open and thereby lose power in the mid and lower leech. The windward Upper stay should not be going loose until you are overpowered. The Light settings are for conditions before the crew is wiring. 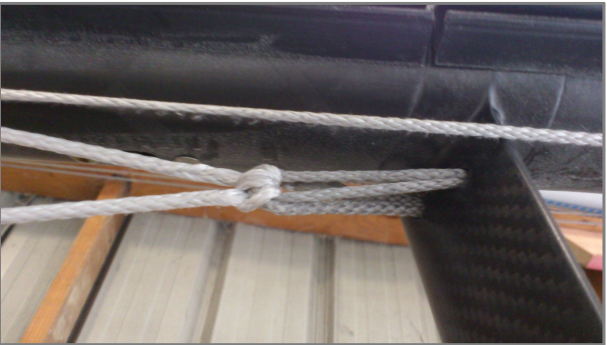 As soon as both crew are wiring, then the forestay tension needs to increase. Base your lower stay set-up on the pre-bend rather than the tension. The most important thing is that the sail looks right. You will be able to do this better looking at the sail depth and sail entry shape rather than just using a tension gauge! Lower stays affect the balance of the boat a lot. This helps tell you when they need changing especially as the wind increases- if the boat feels bad, then often they need to loosened. Small changes make a big difference! Rigging up will be a lot easier if you have a good quality rig tension system with low friction blocks and a good quality 5mm rope. Also needed are some good tools for adjusting the rig out on the water. Rig tension system and rig tools are available from Mackay Boats. The cloth is the same as the 49er- except the thread colour has been changed from blue to grey. The jib is made from the same weight cloth as the 49er jib. The main is made from the same cloth as the jib. This is one weight heavier than the 49er main. The gennaker is the same silicon coated cloth as the 49er. 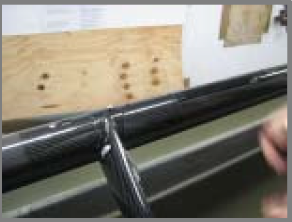 The battens are high quality epoxy battens from RBS and use the RBS rocket adjuster for tensioning. 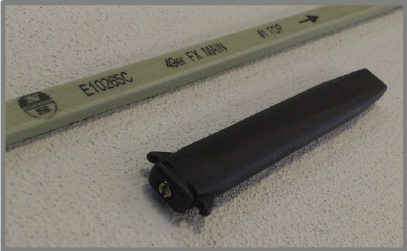 All battens are labelled as FX equipment. You need to ensure that the battens are tight enough so there are no creases coming from the pockets when sailing. The battens will need to be tightened a little after each of the first few sails, but after this can mostly be ‘set and forget’ except for some who wish to try and tune this piece. To increase the life of your sails you may choose to release the tension when you know you won’t be using the sails for a while. The battens are tensioned using a fitting developed by the batten maker. They can be tricky to fit, but once in place are easy to adjust with a small screw driver. We have purposely made the battens as long as possible inside the pocket. This makes it hard to fit them the first time, but after they settle into the pocket you will find it a lot easier. Below is a step by step guide on how to fit the battens into the pockets. 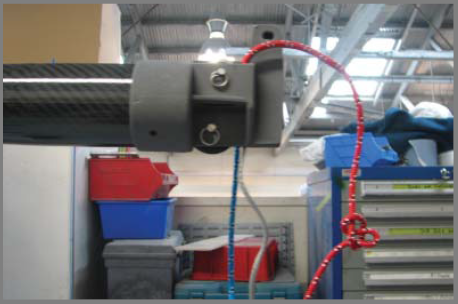 The RBS Rocket tensioner is a female fitting which holds the batten. The batten is able to slide inside the tensioner by turning the screw. 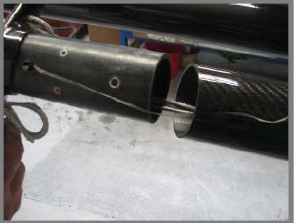 The Rocket tensioner is held in place by dynex cord which is looped over the end of the tensioner and is held in place by the ‘horns’ on the sides. 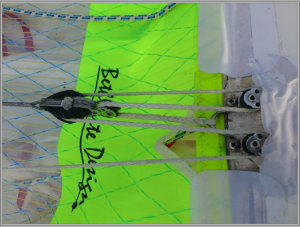 Push the batten into the pocket as hard as possible until the dynex is showing. This will be harder to do the very first time as the batten seats into the pocket. Make sure the screw is undone so that it is about 1mm out past the end of the adjuster. Use a screwdriver to hook the dynex loop over top of the Rocket adjuster. Again this is a lot harder the first time than it will be later! Once the dynex is in place you can turn the screw to tension the batten. The Rocket tensioner should be flush with the back of the pocket. You will soon learn how tight to make it so the sail sets up smoothly on the water. The top 3 battens are the most critical and the #1 batten needs to be very tight to make the head set up nicely and work well through the full wind range. The mainsail has a leechcord. As sails get older they often start fluttering on the leech. You should use the leechcord to stop this so your sails will last longer. The Boom is a standard 49er boom. It is worthwhile fitting a Wichard snap shackle for the outhaul to make rigging easier. The masts are made by Southern Spars in Sri Lanka. The spreaders are standard 49er class spreaders and can be used on both the 49er and FX. Mast and spreaders are painted with a satin finish polyurethane. The class rules allow the top join to be permanently glued and also for the lower spreader to be permanently glued to the middle section. The lower section must be able to be removed from the middle section. This ensures the rigs can fit into a 20ft container for shipping. 1. Fit spreaders to midsection. Slide top spreader (with dynex loops) over join at top of midsection. Slide bottom spreader over bottom join. 9. 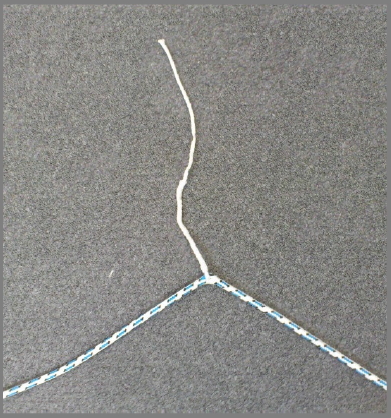 Tie both trapeze lines through both ends of Dynex loop. It is very important that both trapeze lines are ties to the same point so that the dynex doesn’t ‘see saw’ over the spreader. Useful tools when assembling the mast. The main halyard is 3mm dynex rope with a 4mm Spectra tail. Remove the sheaves in the head fitting and attach the end of the halyard to the lower clevis pin on the back of the head fitting. Remove the Uppers stay bolt. The main halyard is a 2 to 1 system and goes through the shackle that attaches to the head of the mainsail. Thread the main halyard into the tip section first and then pull it very tight and tape hard against the side face of the mast. Thread the gennaker halyard through the tip section pull tight and tape against the front face. which you taped the main halyard. Joining The Mast. Now slide the tip section and then bottom section onto the middle section joining spigots. Insert the fasteners and tighten them. You may want to use a thread locker type glue on these fasteners. fine tune the join to get the new section to align perfectly. This is a relatively easy process. Use a flat board with 100g sandpaper to change the angle on either the spreader or mast section as needed. It will need only a very small change so check often as you sand. the mast out of alignment. spreader, make sure both trapeze lines go through both loops. trapeze lines need to be through both loops. Now run the main and gennaker halyards through the midsection, again pulling each halyard tight once they have gone through. Check that the halyards are not twisted. 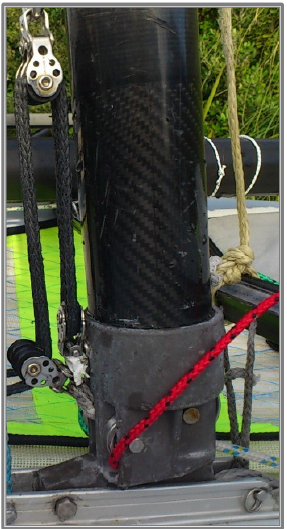 Thread the halyards through the bottom section and out the mastbase using the same taping method to stop the halyards twisting. The gennaker halyard exits out of the front of the mastbase. The main and jib halyards exit through the back sheaves in the mastbase. Attaching the Stays. 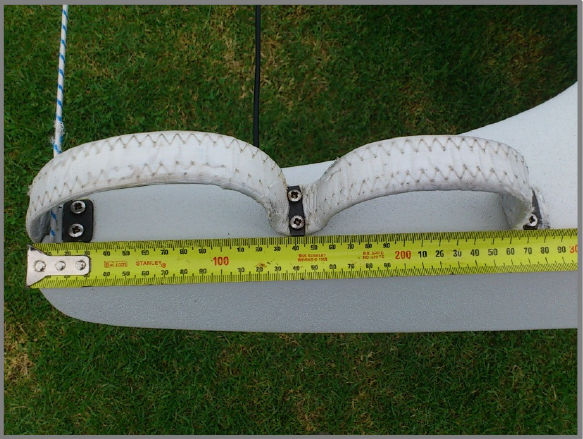 Please note: The T bars on the forestay and main shrouds need to be “long neck” T Bar hooks. These will then sit correctly and allow the swages to line up correctly with the wire. T-bars vary from batch to batch. If the neck is too long there is a risk of them breaking. You should check the T-bars each time you rig up, looking carefully for any cracks where they are bent. Fit one end of one of the uppers (stays with eyes on both ends) onto the uppers bolt on top of the halyard deflector. Then bolt through mast, ensuring the gennaker halyard is in front of the pin and the main halyard is behind the pin. Fit the second upper stay and tighten the uppers bolt. 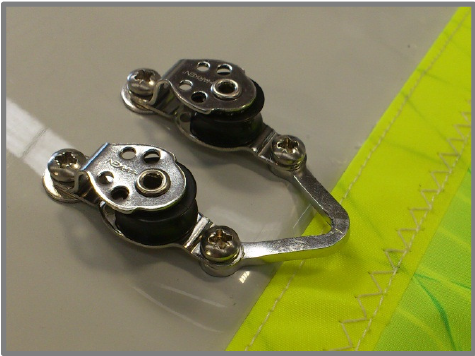 Remove the clevis pins and retainer stay plates from the outer ends of the top spreaders. Place the stay into hook, then refit stay retainer back into spreader with the hook facing forwards. Wrap tape around the spreader end. Rubber splicing tape is best. Next fit the shrouds by inserting the T-bar end of the stay in the mast. These are sometimes awkward to get in. You will often find that they will only go in from one direction- usually the last one you try! The mast wall should be filed a little below the hole so the T-bar can seat properly. Fit the shroud into the lower spreader and wrap tape around the end. Check that the wire out of the T-bar lines up perfectly with the spreader. Often new wires may need the T-bar to be bend a little to align properly. This can easily be done in a vice. attached the forestay to the boat. nuts are tightened, and that all clevis pins and sharp pieces are taped. When you have stepped the mast take a final look before pulling the forestay tight to attach it. You may find it hard to remove the spreaders from the mast if you are taking it apart after sailing a few times. Don’t be afraid to use a rubber hammer to lightly hit the spreader root to get it off. Lightly tap at the root of each spreader alternating side to side. The spreaders are quite strong where they meet the mast! The mast sections and sails must carry “FX Inhouse Certified” stickers to be class legal equipment. The spreaders, wings, vang lever, rudder, centreboard and spinnaker pole must carry “9er Inhouse Certified” stickers. These are the standard 49er parts used on the 49erFX. These will be checked at major regattas. Tapered ropes always help systems to run better. This makes it easier and faster for you to make small adjustments which will ultimately make you sail faster. It is worthwhile teaching yourself how to splice and taper the ropes. It isn’t hard and you only need a couple of basic splicing tools which you can even make yourself. Below is a table for the rope lengths and sizes for an ultimate set-up. This will be filled in over the next couple of months. Information will also be added on the following over the next few months.